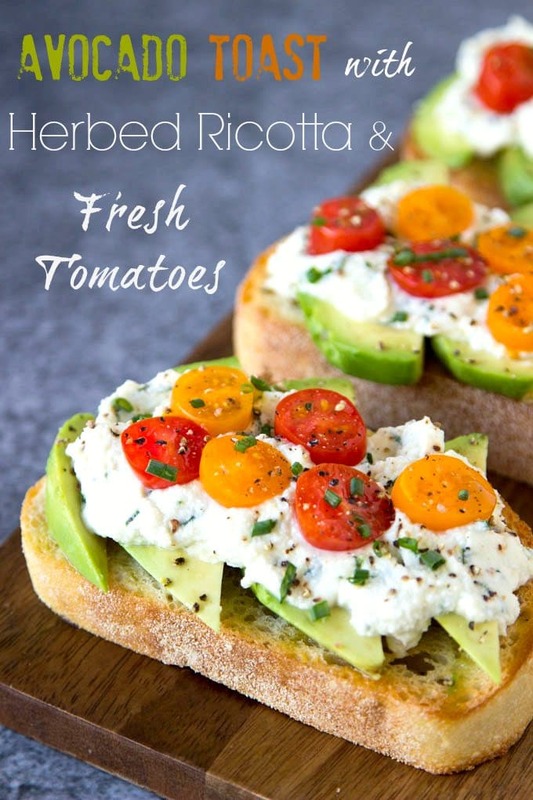 A quick easy appetizer, featuring fresh tomatoes and herbed ricotta. Perfect for game day, potlucks, parties, BBQ’s, or anytime as a light meal. Sometimes the simple things are the best. Sometimes the best (as in end of summer sun-ripened tomatoes) just need the simple things to highlight their magnificence (like bread and cheese 🙂 bring on the tomato bruschetta! Bruschetta is an Italian appetizer which generally begins with toasty artisan bread, olive oil and garlic. 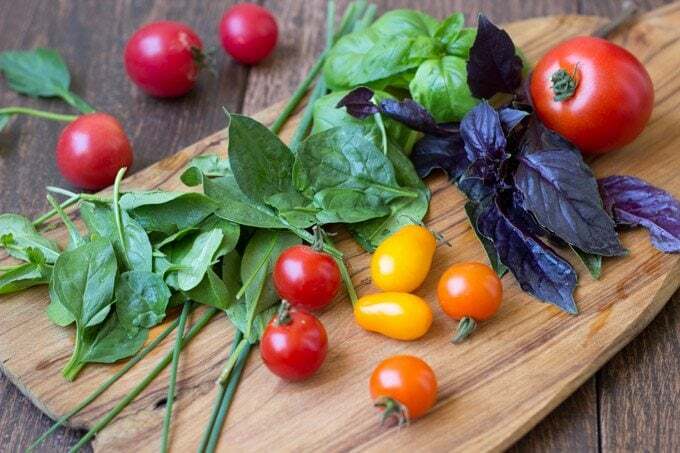 The classic version of bruschetta showcases fresh ripe tomatoes and basil, however bruschetta can be topped with many different things. (It can even be sweet – check out this Chocolate + Strawberry Bruschetta) This version combines all the goodness of the classic tomato bruschetta, but dials up the flavor a notch with the addition of creamy herbed ricotta. 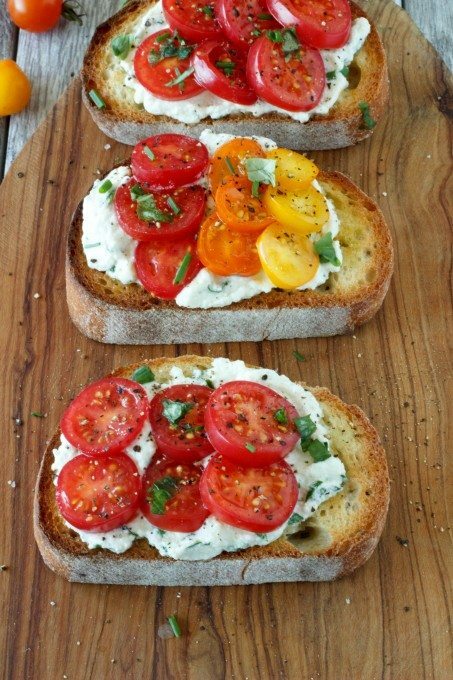 Pair this Fresh Tomato Bruschetta with a big green salad or a bowl of soup and you’ve got a perfect light meal. Want to go a little crazy? ( o.k. not really that crazy) try adding a fried (or poached) egg on top for a breakfast or brunch option. 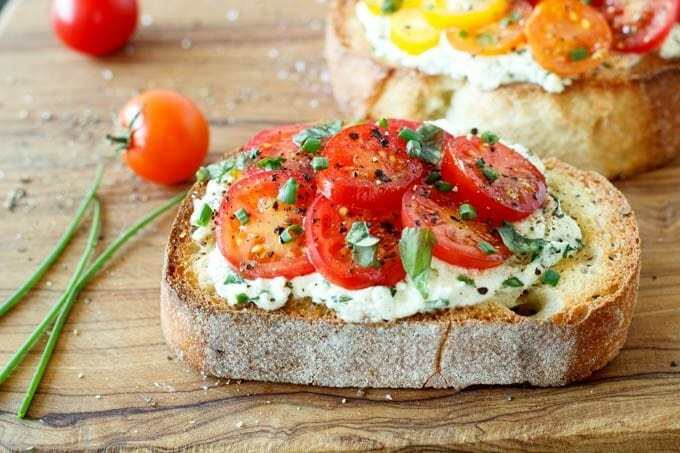 Preparing this tomato bruschetta couldn’t be easier. Cut the cherry tomatoes in half and season with salt and pepper. Room temperature tomatoes are the best for maintaining maximum flavor. Did you know that refrigerating tomatoes actually damages the membranes inside the tomato, causing them to lose flavor and develop a different (more mealy) texture? Yep, it’s true. Adding salt to the cut tomatoes helps to further bring out their flavor. Mix the ricotta, spinach, basil and chives together. Cut the bread in ½ thick slices. Toast the bread in a toaster or under the broiler in an oven ( or you can even grill the bread) until it’s golden brown. Once it’s toasty, rub a clove of garlic over the surface of the bread. The rough surface helps to grate the garlic onto the toast. Drizzle or brush the top of the bread with olive oil. 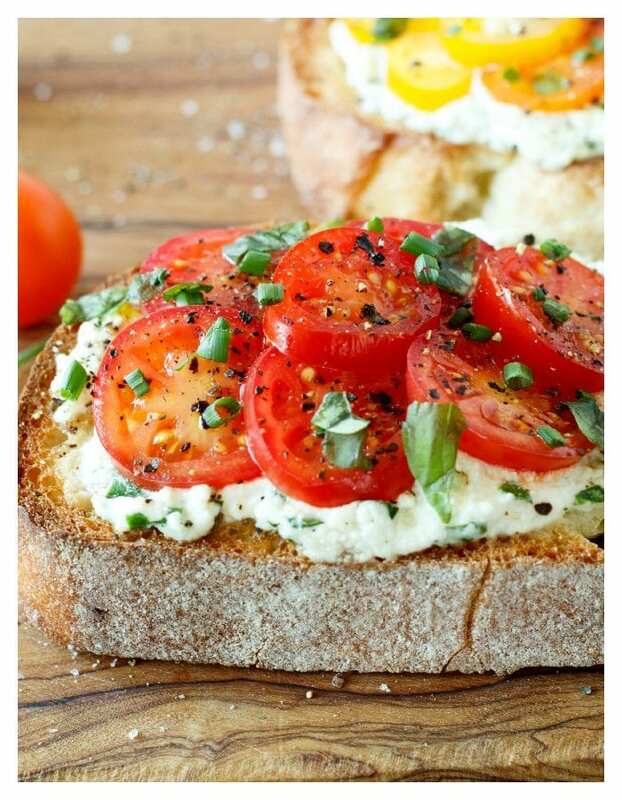 Assemble the bruschetta by layering the toast with ricotta mixture and sliced tomatoes. Sprinkle with salt and pepper. Garnish with snipped chives and chopped basil. Cut cherry tomatoes in half. Season with salt and pepper. Set aside. In a small mixing bowl combine ricotta cheese, spinach, basil and chives. Stir to combine thoroughly. Set aside. Toast bread, in a toaster or under the broiler in the oven ( or on the grill if you like), until golden brown. Rub toast vigorously with whole raw garlic clove. The rough surface of the bread helps shave the garlic clove. (approx. 2-3 strokes per slice of bread, add more or less to taste). Drizzle or brush top side of toast with olive oil. 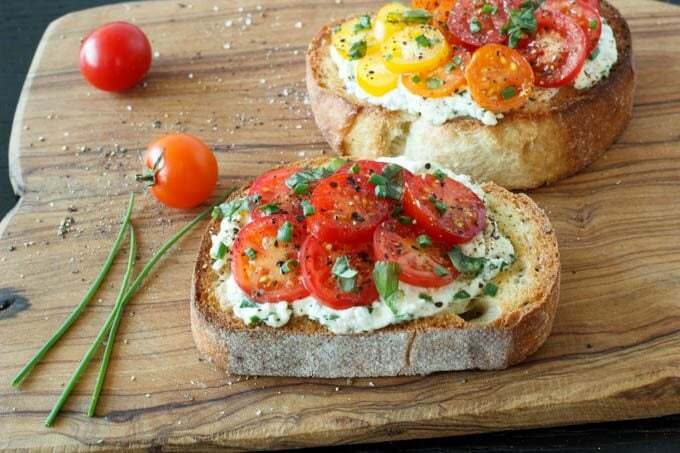 Assemble bruschetta by layering each piece of toast with ricotta mixture, and sliced tomatoes. Sprinkle with salt and pepper and garnish with snipped chives and chopped basil. Thanks for the link love Cat!…much appreciated! I bet this would be really good using fresh ricotta. I just posted a diy tutorial for whole milk ricotta on my blog a couple weeks ago. It was sooooo good (and easy to make)…. I might never go back to store bought again. I’ll have to check out your diy tutorial Patricia…sounds interesting! This looks so good! Can’t wait to try them.